In April and May of 2015, Nepal was struck by two devastating earthquakes. Emergency workers from around the globe, including those trained in health communication, rushed to the scene to assist with disaster relief and recovery efforts. In an effort to help governments, NGOs, and other institutions respond to emergency health situations such as arose in Nepal as a result of the earthquake, the Health COMpass brought together a collection of tools and project examples for SBCC in Emergency Situations. We need your help to make this collection stronger - please send us SBCC resources your organization has developed and used successfully to assist in emergency situations. To add resources, simply register as a user and contribute the materials. NOTE: This Trending Topic was updated in December 2017 - the newest items are at the top of the list below. The SBCC Emergency Helix describes a communication blueprint for strengthening community stability, health system adaptability and the evolution toward resilience. The main purpose of this document is to offer recommendations to prevent the emergence and spread of misinformation in the course of a major infectious disease outbreak, and how misinformation can be corrected. The Ebola Communication Network is an online collection of Ebola resources, materials and tools from and for the global health community. Emergency risk management is usually based on a team approach to decision-making, response and control. In this guide, this team-based approach is applied to the scenario of an avian influenza outbreak, leading the user through the steps necessary to first plan and develop a response and then to secondly, implement the plan. Crisis and emergency risk communication (CERC) )is the strategy used to provide information that allows an individual, stakeholders, or an entire community to make the best possible decisions during a crisis emergency event. The purpose of a public health response to a crisis is to efficiently and effectively reduce and prevent illness, injury, and death and return individuals and communities to normal. This toolkit is a resource for those dealing with natural disasters. It is designed to help program managers to prepare, plan, implement and monitor behavior change communication initiatives supporting health, hygiene and child protection efforts in emergencies. This guide is to help local leaders and community organizers bring together the community to help plan for disease outbreaks and other emergencies. Part One takes organizers through each step, namely: 1. Build support for the process, 2. Invite participants and select tools, 3. Schedule the activities, 4. Hold community activities, 5. Communication procedures are essential to outbreak control. These guidelines provide a list of important steps for communication during disease outbreaks. They are designed to result in greater public resilience and guide appropriate public participation to support the rapid containment of an outbreak, thus limiting morbidity and mortality. This presentation is a step by step guide for understanding crisis/outbreak communication, communication crucial to managing a crisis, explaining the WHO Outbreak Guidelines, and working with the media. Easy to follow checklist for communicating with the media during public health emergencies. An online course which covers several aspects of emergency risk communication. The purpose of this plan, developed shortly after the devestating earthquakes in Nepal in the spring of 2015, is to communicate health risks with communities directly affected by the earthquake in 14 priority districts by focusing on interpersonal communications, dissemination of information, and community mobilization through community volunteers, including frontline health workers and civil society organizations for the immediate six month period May-October 2015. This guide presents the steps necessary for making a community emergency plan as a part of the community mobilization participatory process. The purpose of the guide is to get the community organized and involved in the process of making their own decisions to resolve their health problems. A poster outlining the key steps of a maternal health emergency plan. 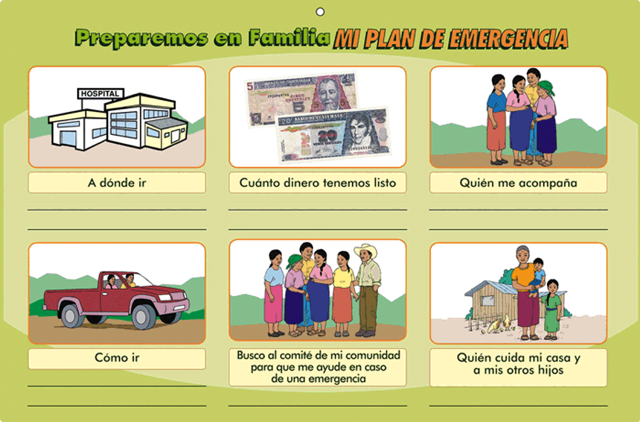 The poster promotes the idea that everybody in the community should take responsibility to plan for emergencies and support families for positive outcomes. This is a checklist based on the PAHO Ebola Risk Communication Plan Checklist and was modified for Ghana, during a 2015 workshop on Ebola communication preparedness.